I’m very excited to start the first of my house tours 2016 with this gorgeous studio that was originally a mechanical workshop. Industrial spaces are a favourite of mine. This white and concrete loft in Eindhoven was simply stunning and so was this beautiful family warehouse in Amsterdam so I hope you’ll enjoy this one too. This is the Stockholm studio of Sarah N Bergman, a children book Illustrator who is also Stylist for Love Warriors, a Swedish brand I have long loved for its ethnic home collection and iconic photos often shot by Hannah Lemholt. 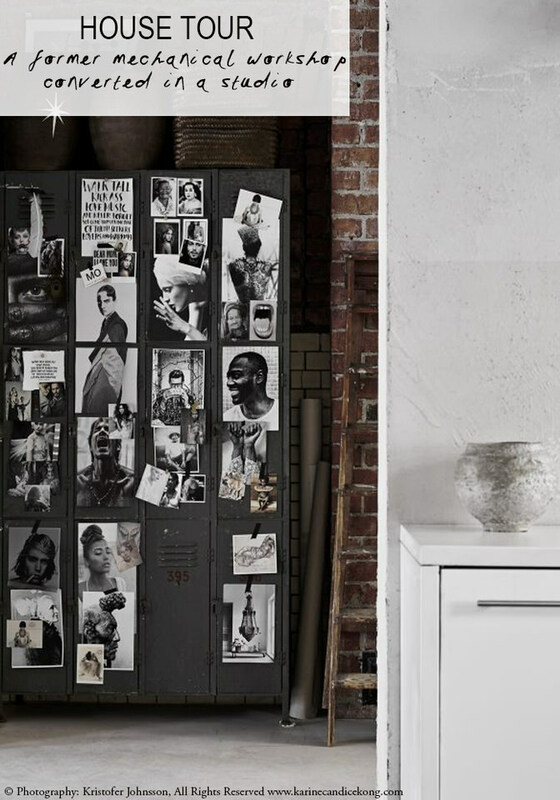 The first detail I loved in Sarah’s studio, was this industrial locker covered with inspiring black and white photos. Such an inspiring mood board, don’t you think? If you are in the US, Chairish has a decent collection of vintage industrial lockers. If you’re in Europe, your best bet is to scour second-hand shops and flea markets. Paris has some amazing flea markets (marché aux puces) and I love going to the annual La Grande Braderie de Lille, which is always on the first weekend of September (03 & 04/09/2016 this year). It’s a great spot to source vintage goodies but you really need book your hotel well in advance. Another styling tip to take from this house tour is how Sarah stored her books with the spines facing. I did the same in my sister’s flat in Paris to avoid colour clashes with her all-white interior. It works if you have a few books in the house and not a while library wall obviously. In this Swedish flat with white floorboards, some of the books were just piled on the floor… The Kant copper light, the Aston pendant light and Freja copper light are all great alternatives to achieve the industrial look above. Last year, we fitted a lot of the Aston pendant lights in various commercial venues and recently dispatched 50 of these black wall lights to a new project in London. I couldn’t find a table similar to the one above but I thought this industrial coffee table from MADE.COM was looking great. Alternatively, the clean lines of this Kaeko coffee table would make a great, contemporary addition. The shop has a great collection of marble chopping boards and you can find large, round trays like the ones below on Amara. I’m loving this round white and silver tray. I love how Sarah kept the hues in her studio monochrome and natural. It’s very calming, welcoming and it feels very homely which is a nice feeling to have for a workspace. The two storage units are the ones called Alex from Ikea and they are great to store art prints. The kitchen units are from Ikea too. You will find similar textured rugs on BODIE and FOU, West Elm (which is currently running a 20% OFF its rug collection), Anthropologie and Urban Outfitters. What was your favourite detail in this studio and if you could describe your ideal workspace, what would it look like? Nice feature! I’d love to see different houses, have advice on how to decorate unusual or challenging spaces – with low ceilings, in the attic, with narrow corridors, small windows. We don’t see enough of this in deco magazines or blogs which is not reflecting most people’s reality. It’s raw, it’s rough, it’s great! Wow, I liked every picture. I am in my fifties and still trying to discover,how to get the look I want ! Sad I know but I will get there in the meantime I am enjoying the journey . So I agree with Lola. As well ,small spaces,how people make dark spaces (not a lot of light ) appear brighter. We’ve just spotted this post and LOVE everything about it! Everything!